Royal Philips has enhanced point-of-care ultrasound with Reacts platform for remote collaboration and virtual training. The company announced an industry-first integrated tele-ultrasound solution based on Philips’ Lumify portable ultrasound system and powered by Innovative Imaging Technologies' (IIT) Reacts collaborative platform. 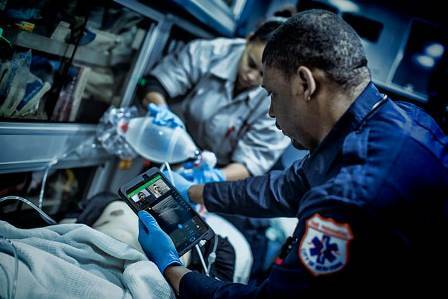 Philips Lumify with Reacts is an advanced tool designed for clinicians, teaching institutions, medical students and residents, emergency medical service providers, disaster relief providers and hospitals with satellite clinics. Through using an integrated system, clinicians can start their Reacts session with a face-to-face conversation on their Lumify ultrasound system. Users can use the front-facing camera on their smart device to show the position of the probe. Later, they can share the Lumify ultrasound stream to simultaneously view the live ultrasound image and probe positioning. It will also allow both parties to discuss and interact at the same time. The integrated solution will help professor to go on virtual ultrasound rounds with students and help them learn anatomy and probe positioning rapidly and efficiently. It will also doctor to consult a colleague and receive expertise and guidance using live streaming ultrasound. In addition, the solution will help an emergency medical technician in an ambulance can to stream the live ultrasound exam and discuss a patient’s condition with an emergency department physician. Philips point-of-care business leader Randy Hamlinns said: “By combining exceptional mobility and reliability, Philips Lumify with Reacts will open up new doors for the way clinicians collaborate, educate and train. Image: Lumify with Reacts is an integrated tele-ultrasound solution. Photo: courtesy of Koninklijke Philips N.V.